Welcome to Green Bay Laser Center where we are raising the standards for quality Non Invasive Aesthetic Laser Services. Using the newest and most advanced Lasers and IPL machines possible, we are able to safely and effectively address your aesthetic issues and problems areas, giving you a more vibrant and confident appearence . Our clinic exclusively focuses on Laser and IPL services which include Tattoo Removal, Hair Removal, Skin Rejuvination, Wrinkle Recduction, Acne Treatment, Sun Spot Removal, Vascular Therapy and Pigmented Lesion Removal. Our Certified Laser Specialists have a combined 37+ years of experience in the tattoo industry as tattoo artists. Our knowledge of tattooing and Laser Training gives us the ultimate advantage in Laser Tattoo Removal and as well as our other Aesthetic Laser Services. At Green Bay Laser Center we use the Quanta Q Plus laser, which is widely regarded as the finest tattoo removal laser available. We use the latest in IPL technology with the Aphrodite Elite by Accuralight. We offer a state of the art, safe and comfortable environment to meet all of your Laser Aesthetic needs. The photo of the tattoo to the left is a prime example of a poor choice of imagery compounded by a poor quality coverup. Soon after this client pledged his love for his significant other he figured out the harsh reality is that “tattoo’s last longer than love”. Out of desperation he went to an unqualifed “professional” and now he has to live the rest of his life wearing Knee High socks. Right? Wrong!! 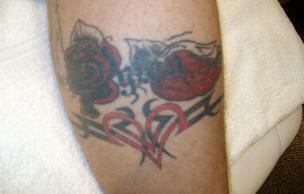 Thanks to todays laser technology this tattoo can be removed without leaving behind an unsightly scar. Or he can get it faded enough to get a proper cover up done by a real professional.